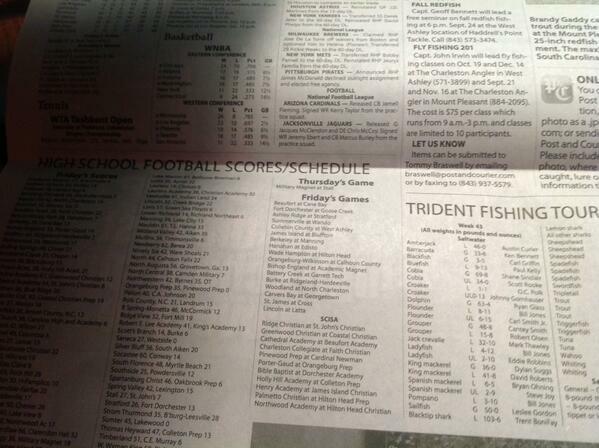 Last week was a great week for high school football, with some interesting games all around the Lowcountry. The theme was ending the streak. Two losing streaks totaling 84 games ended last week. Colleton County ended a 36 game losing streak by upsetting Wando 40-37 in a game that the entire Charleston area saw on WMMP. With the streak possibly ending, people turned their eyes from NFL and college games and went to Walterboro to watch Darren Goldwater and Nate Ross call the end of this one. Here's a video if you missed it from the wild scene at the end. Colleton County is a legit team, folks. They have some athletes and with the schedule they play (undefeated West Ashley on the road next, then a test against Stratford followed by Cane Bay and Ashley Ridge on road) could make it really tough for teams in Region 8-4A. A lesser known story is Lincoln. Lincoln with James Waring has greatly improved this season. They have gone from being maybe the worst team in the state to competing in all their games. They finally put it together in the woods of Marion County, beating Creek Bridge 32-22 to end a 48 game losing streak that started in 2008. There were several other big games last week which shaped the landscape, maybe for the season. In the most hyped local game of the week, with U.S. Senator Tim Scott in attendance (two local TV stations went live from Summerville's stadium at 5 a.m.), Goose Creek went into John McKissick Field and beat a game Summerville team 34-17. The game was close until the final few minutes, when the Gators finally put it away. They asserted themselves as the top team in the area in what could be their toughest test of the regular season until the Stratford game. Stratford earned a big win at Fort Dorchester this week, 26-13. Georgia offensive coordinator Mike Bobo was in attendance, watching Jacob Park throw for 323 yards and a TD. He also ran for a TD. Berkeley earned an important win against Cane Bay; Beaufort shut out Groves of Savannah; West Ashley beat Ashley Ridge on the road; Stall beat St. Johns; Georgetown humbled James Island; Charleston Collegiate put 82 on Coastal Christian; Bluffton humbled Ridgeland-Hardeeville; and Bishop England eventually got a 3-TD win over Porter-Gaud. Garrett beat Military Magnet, and Academic Magnet won. This week, I will give you some quick hits: Military Magnet (2-2) at Stall (1-2) (Thursday): While Clemson and NC State are playing in Raleigh, WMMP serves up a battle of North Charleston teams. Stall won its first game last week; can they start a winning streak? St. James (1-2) at Cross (1-3): St. James jumps down two levels from 3A to travel to 1A Cross. Cross has been a little down this year; but can they get their mojo back after two tough road losses? Berkeley (1-2) at Manning (3-1): A tough game for the Stags, as they head to Manning, who has blown out Scott's Branch and Marion and picked up a nice win over Lake City. Hanahan (3-0) at Edisto (3-1): This is a sneaky tough game for Hanahan. They have to make the long ride to Edisto to face the Cougars, who jump up in competition this week. Will the Hawks be ready? Bishop England (1-2) at Academic Magnet (2-1): Region play starts in 2A for both of these squads this week, making it a very important game. Can Bishop England defend their title? Can Academic Magnet replace HB Stuart Walters? This week is a very evenly balanced week. There's several good games, but none that jump out like last week. Any of the top four could be your game of the week. 5. Beaufort (3-0) at Cane Bay (0-3): Beaufort makes their first trip to the Charleston area this year against Cane Bay, who has stumbled in their first three games. Beaufort is 2-0 currently on their very rare four game road trip, with shutouts at Groves in Savannah and at Aiken. Cane Bay has lost to Summerville, Fort Dorchester and Berkeley, with only Fort Dorchester at home. The Cobras hope that they can upset the Eagles here to get back on track. 4. Summerville (2-1) at Wando (2-2): Summerville had a tough loss last week against the Gators. They suffered an even tougher loss Tuesday, as it was learned that Darin Smalls, their top DB, a South Carolina commit, suffered a torn ACL. He is out for the season. Wando has to bounce back from the embarrassment of ending a 36 game losing streak for Colleton County. A silver lining: Wando is 2-0 at home this year, and has lost both games on the road. Look out for that. 3. Ashley Ridge (0-3) at Stratford (3-0): Stratford had one of the most convincing wins in the state last week, beating Fort Dorchester by 13 on their field. Jacob Park has improved each week, and Georgia OC Mike Bobo came home impressed last week. Ashley Ridge, even though they have almost 25 seniors, have had a very tough season so far. They were blown out in their first two games, and lost last week 20-10 to West Ashley. It won't get easier this week heading to Stratford. 2. Fort Dorchester (2-1) at Goose Creek (3-0): The battle between two of the steadiest teams in the Lowcountry is always an interesting one. Fort Dorchester stumbled last week against Stratford, but have a very young team which is looking to peak in the next few seasons. QB Kobe Garrett is a junior, who should be one of the best QBs in the Lowcountry next year. This year is a different story. Goose Creek showed they were the best team in the Lowcountry last week, and like all good gators, showed a finishing bite against a Summerville team who had the crowd behind them. They start a two game home stand before closing with four of their final six on the road. Can they match last week's output? 1. Colleton County (1-2) at West Ashley (3-0): This is a battle of the two most improved teams in the Lowcountry. Each has convincing wins over top opponents. Last year, the Cougars and Wildcats combined for one win all season. This year, they already have four headed into the fourth week of the season. Colleton County gets the chance to start a winning streak, while West Ashley QB Pedro Manigault has a chance to earn another win for his team. West Ashley and Coach Bobby Marion have started 3-0 three times in the last five years. However, they have never started 4-0. They have the chance to Friday night.